Ordinary Goodness: My father's prayer. 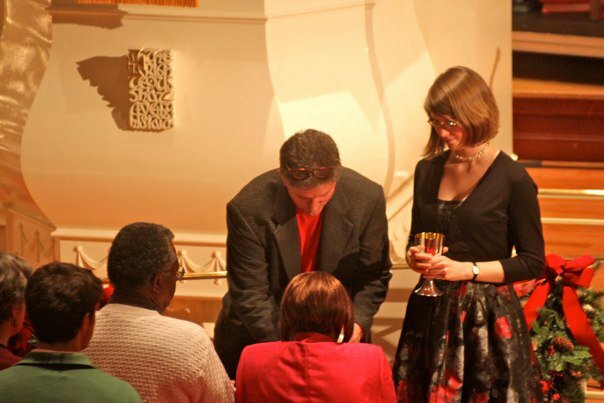 Serving Christmas Eve Communion with Dad. For those of you who don't know my father, you are missing out. For many reasons. One reason is that he taught me more about faith and community than he did about sports. (And he taught me a lot about sports - not least of which how they can be a source of faith and community!) Today he sent me a prayer that he wrote and read at our church's Sunday evening worship service. I wanted to share an excerpt of it here because I think it offers hope, courage, gratitude, holding on in the struggle - all pieces of goodness that I (and maybe you) need in my life today, this week, always. Thanks, Dad. We gather together in this room today to share our fellowship and love for you, your perfect son, each other and all who we hold in our hearts, known and unknown. Know that we live our lives full of questions about our faith and we so badly want you to speak to us in a voice that is clear and easy to hear and understand. We want obvious answers that are simple and direct. Does our belief in your love and power increase when our prayers are answered? Or do we experience doubt when tough times, loss and suffering knock us down and we wonder where the heck you are? Perhaps one of our biggest tests as people of faith is to continue loving you and look for your good works, to be a daily part of your good works, in the midst of this roller-coaster ride we call life. Help us to seek and walk that path. But God, I'm betting that you and your love are with us always. Within easy reach through all we see, hear, touch, smell and sense every day. God, I am convinced that you do reach out to us nonstop, but our challenge is to find you each day, soaking up the grace you pour into our hearts, minds, souls and actions; and to discover ways to pay that grace forward to others. This is a wonderful prayer - and a wonderful picture!